When it comes to supporting additional storage capacity, Mac Pro computers(1) have hidden potential—it's behind the fan assembly. Two extra SATA connectors sit on the logic board, just out of view and ready for you to connect more drives. Unfortunately, there’s no easy way to install additional drives inside the Mac Pro—fortunately, that doesn’t matter. Many PCs also have unused motherboard SATA connectors. Sonnet’s eSATA Extender Cable enables you to connect two external hard drives to the unused SATA ports on your computer’s logic board and take full advantage of its built-in storage capabilities. Sonnet’s eSATA Extender Cable simply plugs into the your computer's spare SATA connectors and extends them to the back, where you can easily connect up to two external hard drives(2). Because you’ll be connecting the drives via eSATA, you’ll experience the best performance possible, with data transfers up to twice as fast as FireWire®! Since the eSATA Extender Cable is not a host adapter card, it’s a great solution for power users needing all their computer's PCI Express bus bandwidth for other interface cards. 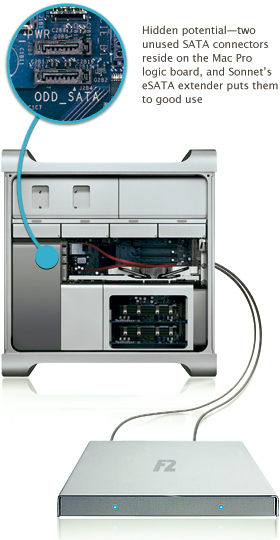 Operation is plug-and-play, and detailed installation instructions are included for original Mac Pro computers as well as the latest (early 2008) models. Not compatible in Mac Pro (Early 2009 or later models). Mac Pro and Windows motherboard SATA neither supports drive enclosures with port multipliers, nor the capability to hot-swap drives.